This is one impressive horse! We have been purposely taking it slowly with Wrembrandt because of his size and constant growth spurts. He truly has exceptional gaits, a huge over step at the walk, a fabulous trot and a canter to die for. We haven't even tapped into the many gears he has to his disposal within his gaits. His temperament is exceptional, he stands like a rock on the cross ties for grooming and bathing and is just a wonderful horse to work around. Wrembrandt happily goes out on trails around the farm and even walks confidently along the side of the road in traffic. He loads and trailers well and is getting used to working off the farm in different locations. 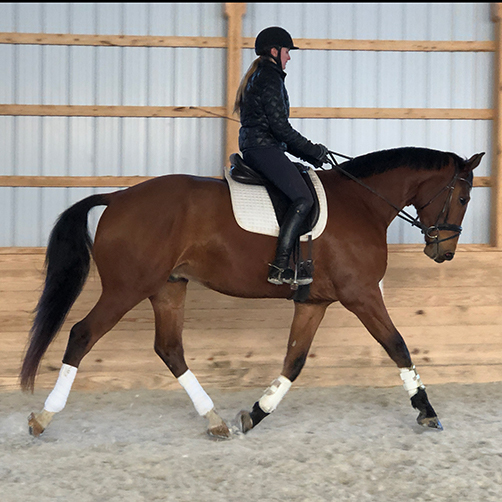 In addition to dressage training he is being going over small x rails and is just a happily guy who is very willing to please. 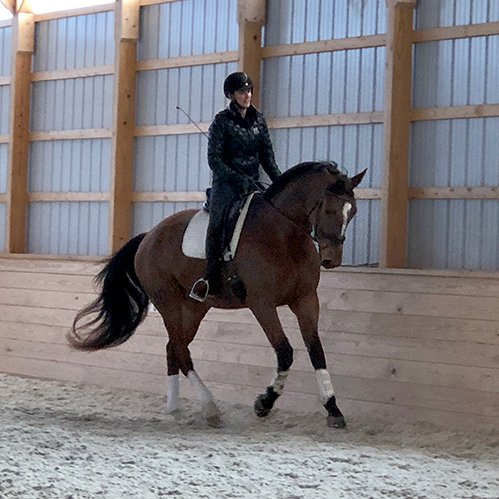 Harmony’s Wamberto was Champion of the 2006 KWPN Stallion Show and then became Champion of the 2007 100-Day Stallion Performance Test at Paxton Farm. He earned perfect 10’s for his character and canter, and 8’s and 9’s for his walk, trot, and rideability. Wamberto’s sire, Rousseau, was the 2003 Silver Medalist of the WBCYH. 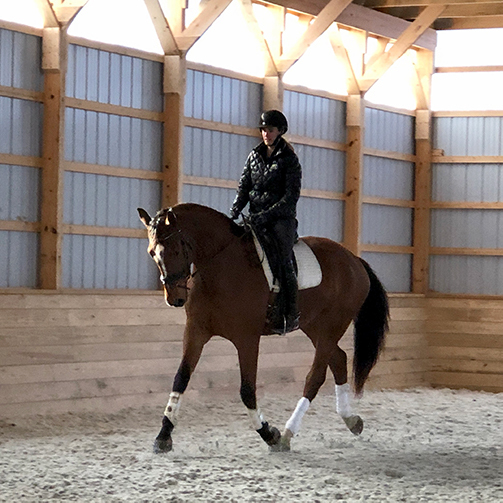 On the dam side, Capricia is an Elite Hanoverian Mare and was Grand Champion at the prestigious Dressage at Devon in 2001 and the winner of the American Hanoverian Society trophy the same year. Capricia was trained to Grand Prix and successfully competed thru to Intermediare before retirement and becoming a broodmare at age 18 years. 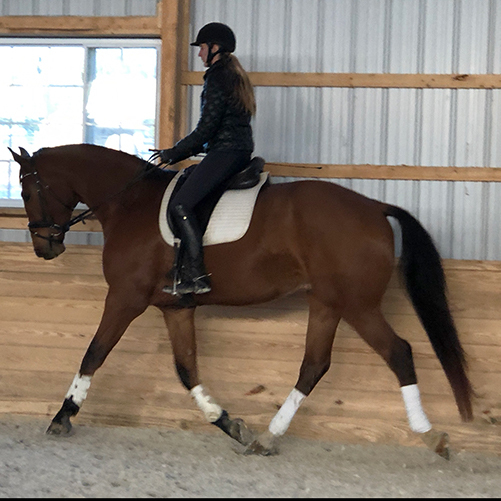 Capricia is a full sibling to Hilltop Farm's Hanoverian stallion Contucci who has sired over 80 Premium foals, many Site Champions, many Premium and Elite mares and several approved and licensed sons. Their sire is The Grand Prix Trakenhner stallion, Caprimond who has ranked #1 in value for conformation and type in the Hanoverian Yearbook of Stallions since 1999. Wrembrandt would be best suited for an athletic amateur or a professional. With his power, gaits and willingness to work we are extremely excited about his future. Wrembrandt is of exceptional quality and is full of potential. He will continue in training. His pricing will be changing accordingly depending on training and show experience. If interested, please contact us for up to date photos and video.